The overclocked Logitech MX500 tops the chart despite being notoriously hard to find in stores. Following closely behind is the more recent Logitech MX518, which despite having a higher resolution lacks the Perfect Control that the older mouse manages without a problem. The overclocked Logitech MX300 isn't far behind, getting marked down a little for having less buttons. The Razer optical mice do particularly well. The Diamondback scores higher than the Krait for having more buttons. The A4tech X7 mouse follows them with its good all-round performance. The suprise entry in 7th place is the Creative Fatal1ty 2020 mouse, beating laser mice from the more established mouse manufacturers. I've also devised a second chart to show Bang4Buck as our friends at Hexus like to put it. This one shows how much MouseScore you get for each pound spent on the mouse. For mouse shopping on a budget, this is the chart for you since you can pick a really good value mouse from the list. In almost every mouse review I've read, the writer makes the automatic assumption that laser mice must be better than optical. I imagine it's down to the perceived firepower of each word. No one ever destroyed an Imperial Cruiser with an LED gun. The performance benchmarks show that todays batch of laser mice can't keep up with the finely tuned optical ones. They do have slightly higher resolution, but not enough to make up for their poor performance at speed. Some Logitech and Microsoft mice have a huge performance boost when you overclock the mouse port, because of an interface limit. Specifically they are: Logitech's MX300 & MX500 and Microsoft's WMO, IE3.0 & Laser 6000. My recommendation is to set the USB rate to 500Hz for these mice, but using a USB tool that only affects the port that has the mouse plugged in. The response on other mice did not change when overclocking the USB port (or they had a higher clock rate by default). For future articles I hope to include a wider range of mice (assuming the manufacturers get around to sending samples), and benchmark new products as they are released. The Razer DeathAdder is coming very soon so there will be a new article for that as soon as I get hold of a sample. I'm currently building a database to make it easy to find detailed information about any mouse you might be interested in. I will be posting a followup article where I test the most popular mice on various mousepads to determine which surfaces produce the best response. Steelpad and Qpad have both sent samples for this article but I still need a wider range to test. If you make mousepads for gaming please get in touch with me, so I do not miss out your products! I hope to build more benchmarking setups to test different aspects of the mouse apart from the speed-response characteristics. This would include the mouse buttons, sensor latency, and output smoothness. Scoring these different attributes is slightly more complicated but I have a good idea of how to go about creating the tests. This article has taken me many weeks to devise, build and compile. It is the culmination of a huge number of discussions in the ESReality forums, and the heated debate that goes on about mouse performance on this site. I hope the results are useful, and indeed I would be glad to see information from this article make it's way on to future mouse reviews (although links back to here would be even better!) 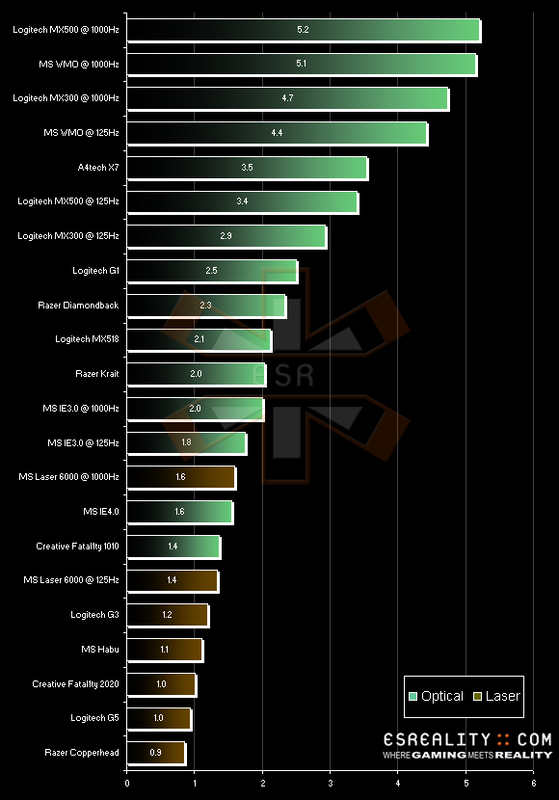 I hope that producing real benchmarks for gaming mice go some way to ensuring competition between manufacturers and better hardware in the end for us to play on. 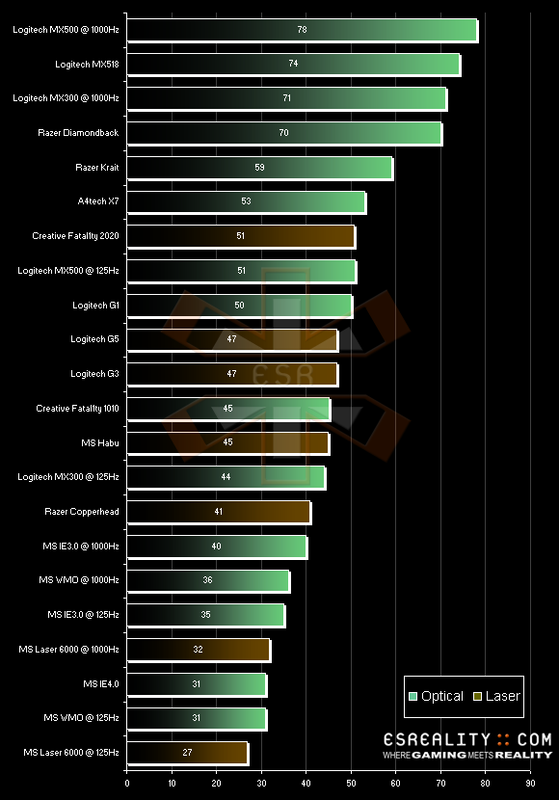 If you have a mouse or mousepad that you want involved in these MouseScore benchmarks, contact me to arrange delivery.